I attended a fascinating discussion yesterday at the Munk School of Global Affairs at the University of Toronto. It was called "Tweeting the Arab Spring." And three young journalists who are part of this new media expression spoke to a standing-room only crowd. Moderated by one of Canada's most experienced and thoughtful foreign correspondents, Brian Stewart of CBC TV News, the panel consisted of Sarah Abdurrahman, a Libyan American producer for NPR/WNYC’s "On the Media". Sarah is described as "a key player in the worldwide effort to disseminate news from Libya and connect the Arab diaspora." Jill York is a columnist for Al Jazeera English and Director of International Freedom of Expression at the Electronic Frontier Foundation based in San Francisco. And Sonia Verma is a print reporter with the Toronto Globe and Mail who has been providing powerful reporting on the ground from Egypt, Tunisia and now Libya. All had amazing stories to tell about how new media in general, and twitter in particular have been used to pinpoint stories, to identify locations where demonstrations would occur and to give a level of participation from English-speaking demonstrators that would have been impossible only a few years ago. Reporters have been tweeting regularly to find people who can help them tell the stories with more clarity and power. Arab tweeter are eager to connect with western reporters. Ms. Abdurrahman was the youngest of the three young women there. Interestingly, she was the most skeptical about the value of tweets in reporting. But as she explained, the clarity of the communication couple with the urgency of events allowed her and the others on the panel to have access to a journalistic experience that is not as easily available for other more conventional reporters with cameras and microphones. All agreed that there are dangers inherent in this process. First, there is the sophistication of the still functioning regimes. Chinese technology has been sold to the governments in order to identify tweeters and facebookers. Syrian and Moroccan authorities are jailing cyber-activists and demanding they reveal their passwords under threat of torture for them and their families. This is a tough neighborhood, and the stakes remain incredibly high. While it was impossible not to admire these journalists for their courage and sense of the story, it occurred to me that they all expressed tremendous optimism about the future of the region. Unstated (and unasked by anyone in the audience) was the historical parallel with previous revolutions and the eagerness of western media to anticipate the best of all outcomes. Many western journalists were eager to embrace the fall of the Shah and to contrast him, in western media terms, with the Ayatollah Khomeini. The former as a vain and corrupt despot and the latter as a colorful if somewhat severe leader who at least was surrounded by deeply democratic and liberal progressive advisors such as Abolhassan Bani-Sadr and Shapour Bakhtiar. Their moderating effect was short-lived, as were they. That's not to say that the outcome of the Arab Spring is doomed to end in a frenzy of theocratic repression as did previous efforts at reform in the region. 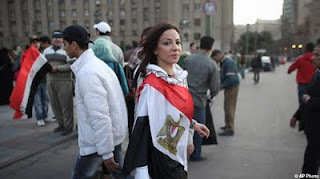 But, as Ms. Abdurrahman told me afterward, the demonstrations in Egypt that overthrew Mubarak were far from spontaneous. Young Egyptians and other North Africans spent years in Europe, learning the craft of internet communication and organizing tactics. And clearly, they learned their lessons well. But she added, the Muslim Brotherhood is better organized and they have been waiting even longer than the young cyber-rebels...waiting for the right time to make their move. Western media might do well to keep a skeptical and a historical eye on events as enormous change rolls across the region.